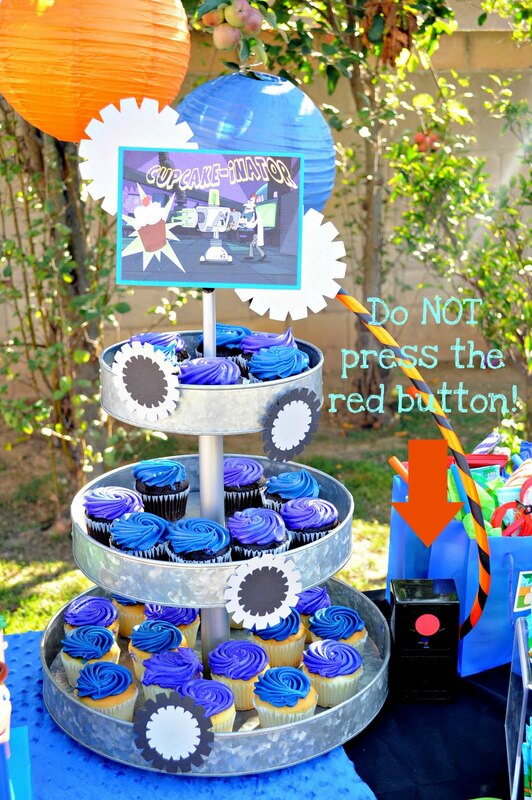 This past Saturday my sister had a party for my nephews 5th birthday. My nephew LOVES Phineas and Ferb, so it was a no brainer what the theme was going to be. Because I am the awesomest Auntie EVER ;) (and a control freak) I decorated the party. Made small centerpieces and of course put together the dessert/favor table. The kids tore that sucker up! Seriously. Jello shots! The "clean" kind. Heh. I cut down some paper straws to fit the mini cups. Kandy Kones by who else but the Kone queen herself, Posh Party Pretties! Made up some quick labels for the lollipops. This mini bunting for the smash cake was a perfect fit to the party! Like the giant magnifying glass? Dollar Tree baby! Small centerpieces but still fun! Yes, I totally came up with that! LOL. Favors included: handcuffs, mini magnifying glasses, P&F markers, P&F fruit snack packs, mini skate boards, striped lollipops and chips. Haha.... Had to sneak in a photo of my Nate! My gorgeous nephew, the birthday boy! He definitely loved this gift! The Mama (my sister) and the Birthday boy! My kids LOVE Phineas and Ferb too...you did an amazing job! Love the jello shots & pinwheels!! Awww J. you sure know how to throw and style a party! I must admit... I think Phineas and Ferb are the ugliest little characters ever - but you made them look so fun and cute! You are so awesome! I stumbled on to this site from Pinterest. I'm planning my son's 8th birthday and was having a hard time with a P&F theme. Thank you so much - very inspiring! 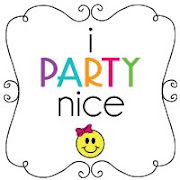 LOVE, love, LOvE what you did for this party!!! Very creative. Thanks for the great ideas! Believe it or not, I'm doing this for my husband's party this weekend! Great job. This is such an adorable party! Kudos to you for all of your hard work. Can I ask where you got the navy tablecover? I have been looking for something in that exact shade for an upcoming party of my own. 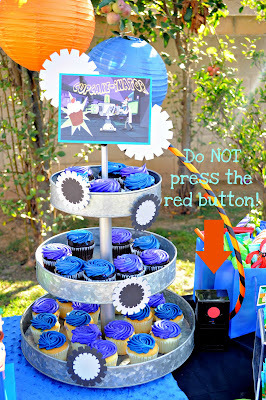 Love the cupcake-inator. Any tips on how you made it? Everything looked great! Where did your sister buy the activity books? Great Party, you thought of every detail. My youngest son has his bedroom decorated with P&F. Not going to lie, I might steal a few of your ideas and decorate his room with them. Pinatas will give us a lot of fun in our parties. Your Content is great, i love the way you explained. The political time coming soon, here we can blast our party with Donald Trump Pinata Theme.